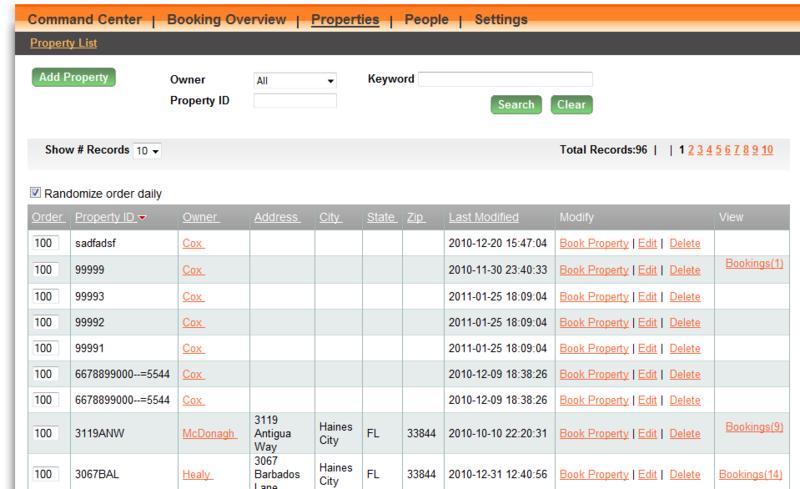 We created a powerful administrative portal that manages vacation condo and villa rental bookings. 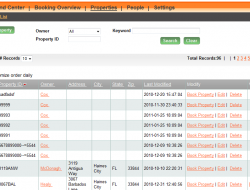 Rental managers can view booked properties at a glance, manage a guest database, process bookings and fees, manage owner logins, and so much more. 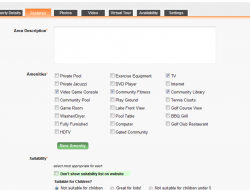 The system integrates with existing websites, allowing visitors to browse listings and submit a reservation payment, and instantly updates the availability calendar. The rental manager is extensive, and covers a wide range of needs. However, we’ve discovered that customers will often look to on-size-fits all solutions to fill a specific need. This may work in some cases, but our aim is to provide a solution that does exactly what you want it to do. Let us know how we can help. 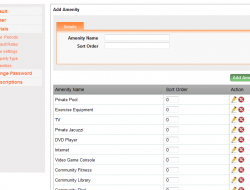 Following is a quick overview of some of the features that we included in the rental manager. 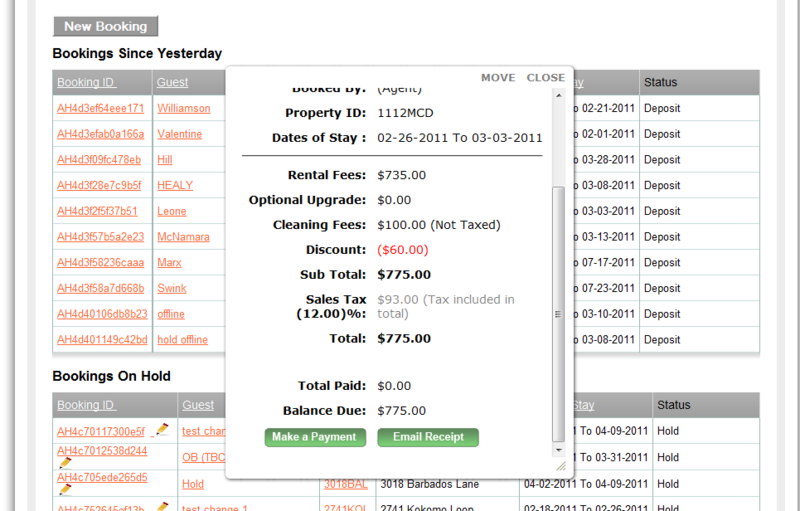 The Command Center is the rental manager’s landing page for quick information. 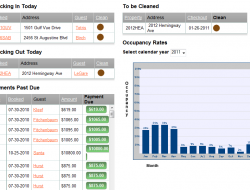 The Command Center lists bookings made since the prior day, guests checking-in and -out of properties, payments past due, properties that are in need of cleaning, and features a quick form to take a new reservation. 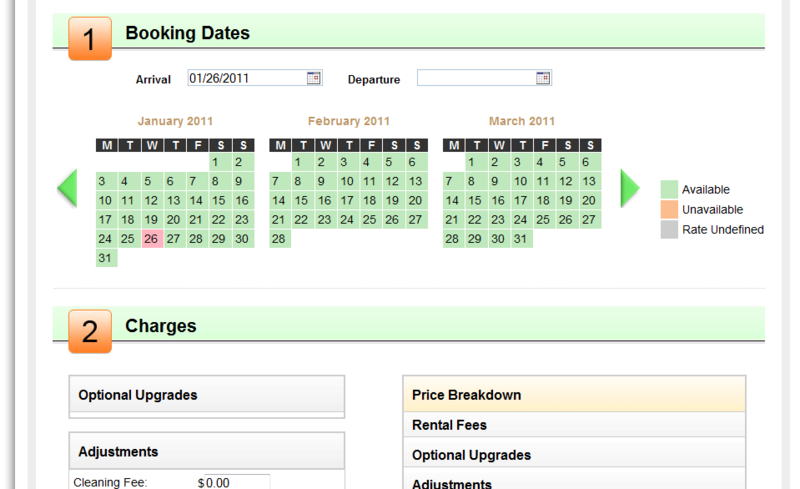 Within the Command Center, every booking shown is clickable, providing a popup with details about the particular reservation. 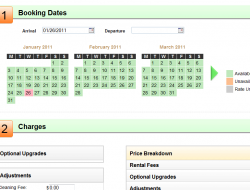 Listed in the booking details is the option to make a payment on the reservation, or email a receipt to the guest, as well as edit the booking. 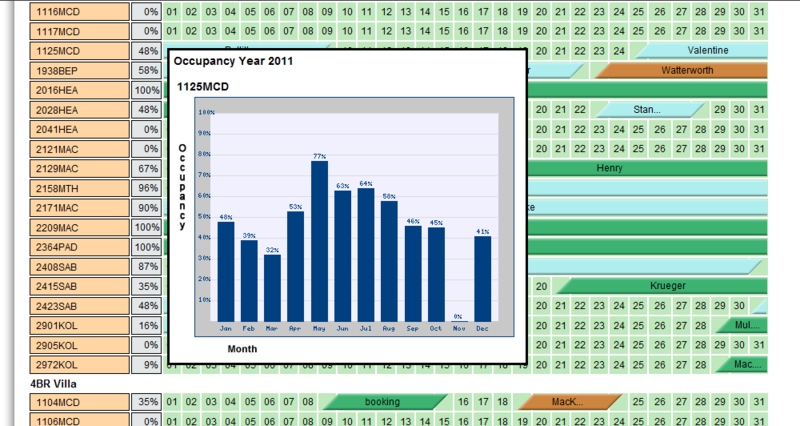 Also featured in the Command Center is an occupancy rate chart that allows users to manage turnover and project seasonal fluctuations. The Checking in Today section gives a quick view of activity occurring that day and which properties might need immediate attention. 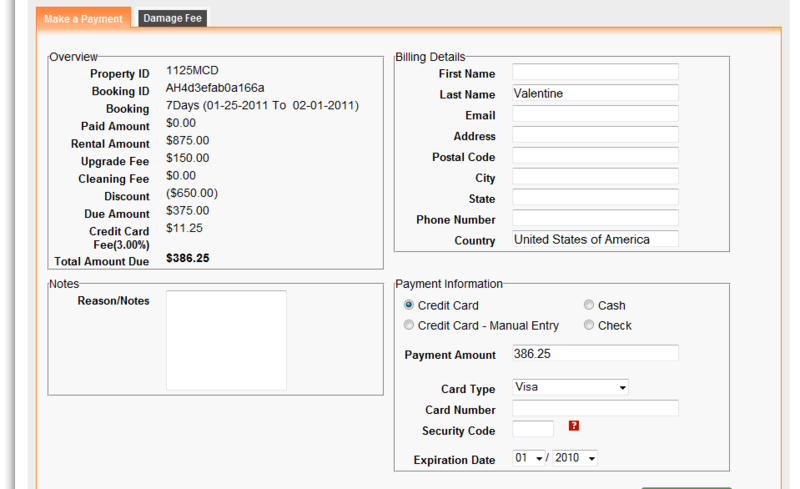 Towards the bottom of the screen is listed payments that are past due. 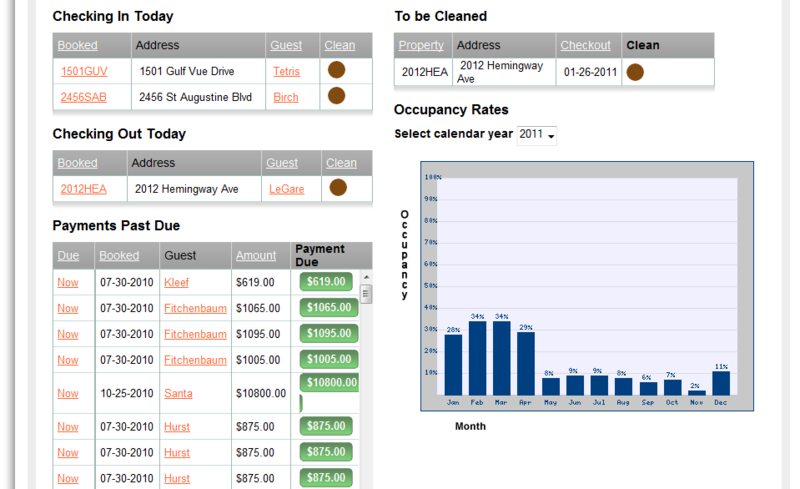 The Booking Overview allows users to visually see occupancy for rentals, a month at a time. 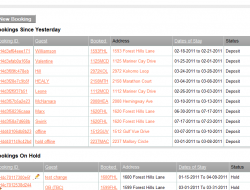 Properties are listed on the left, with dates blocked out when the property is occupied. 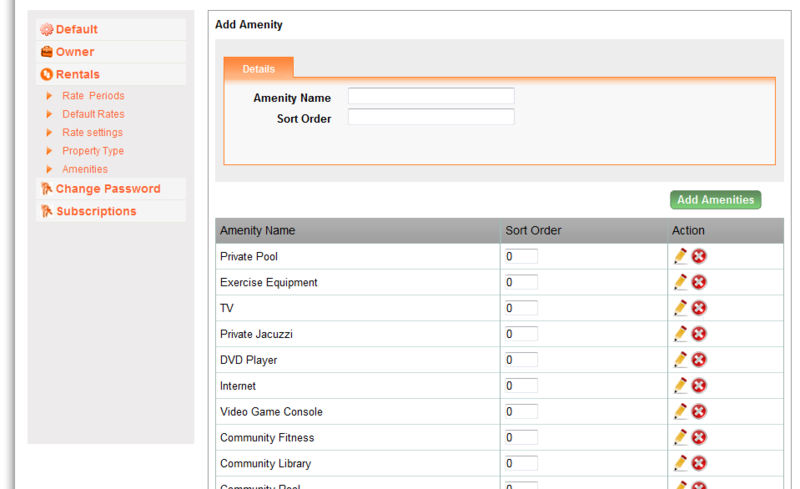 Filters at the top allow for sorting capabilities, categorization, and organization. 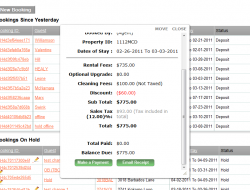 The rental manager helps users organize properties by offering numerous settings, like color distinction, to manage who booked each property. 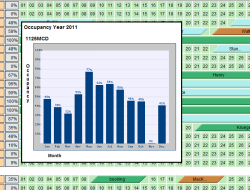 The percentages next to the property name displays the occupancy rate for the current month. Hovering over that percentage displays a pop-up of occupancy rates for the entire year. 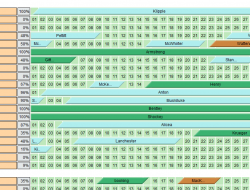 A three month calendar is displayed, showing the property’s availability. 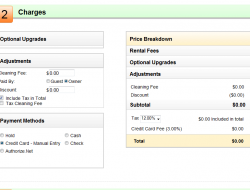 After the dates are chosen, the rental manager allows for price adjustments, including cleaning fees and upgrades, takes the payment method, and offers a tabulated bill on the rate displaying the guest’s total price. 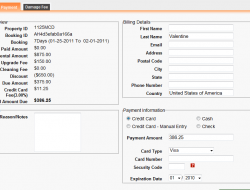 The payment screen allows users to keep record of how payments are made, adds tax, and calculates totals. 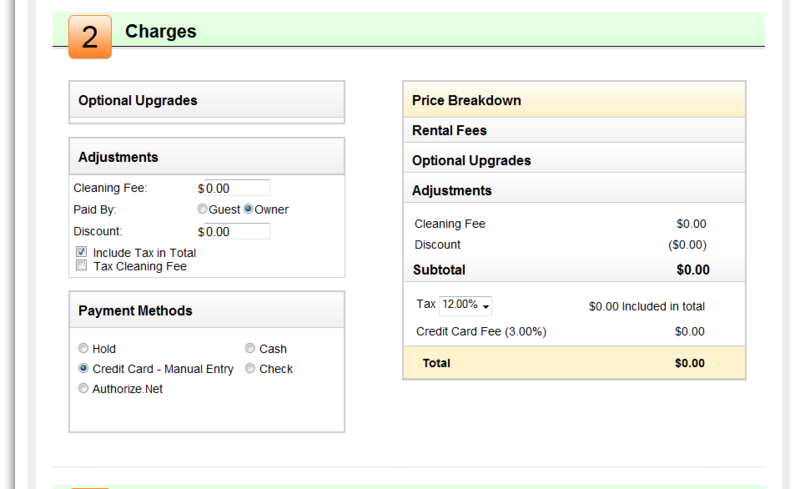 Using Authorize.net or PayPal, the rental manager process credit card charges right through the software. Damage fees can be tracked as separate transactions for organization purposes. Adding properties can be done in three different ways. 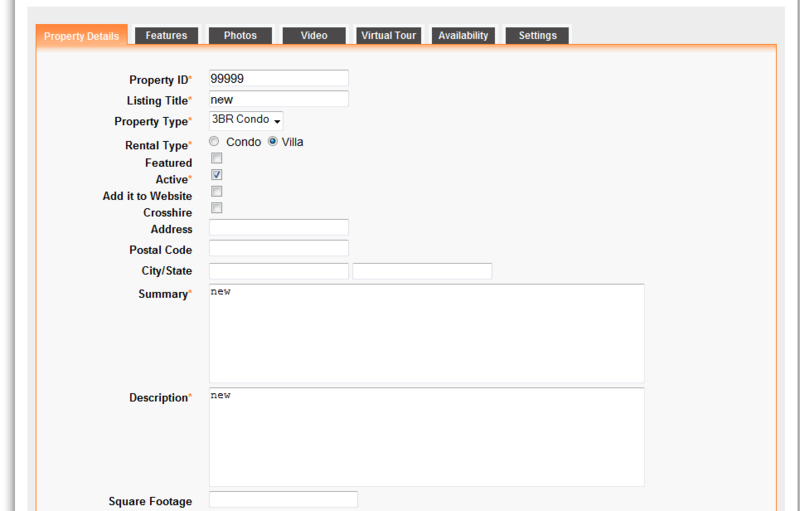 The rental manager allows for single additions for complete customization, a quick add feature displayed above which allows for basic information for up to 25 properties to be added at once, and an import feature that uploads from an excel file up to 1,000 properties at a time. 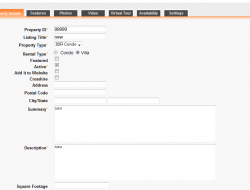 When adding or editing a property, the booking manager offers many different features to describe the property accurately. 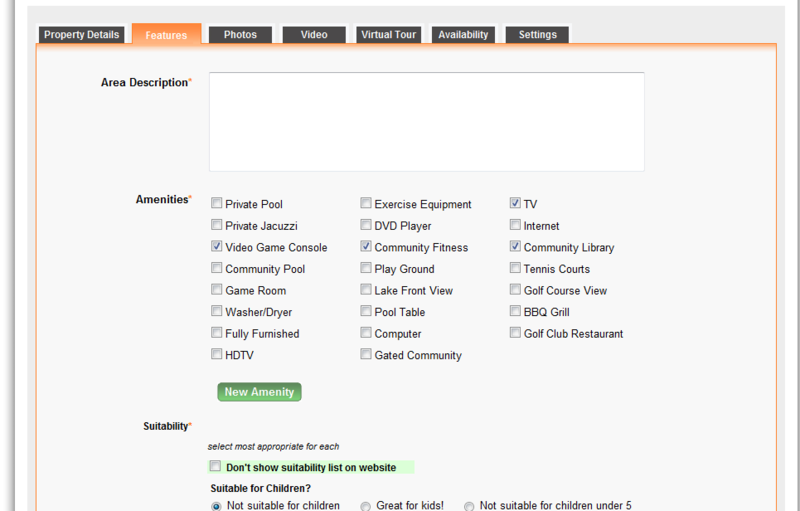 Property descriptions, photos, videos, upgrades, and suitability are just a few of the many customizable aspects of the property feature. 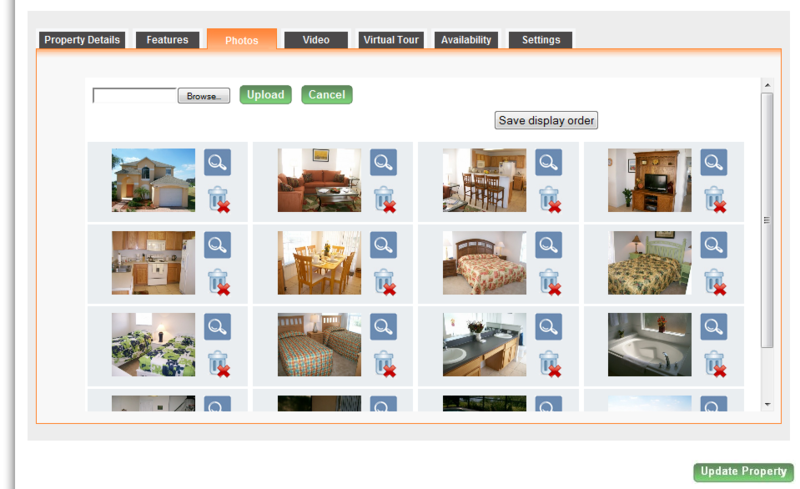 Included in the property details is a photo gallery with a drag and drop feature to set the order of photos you desire. 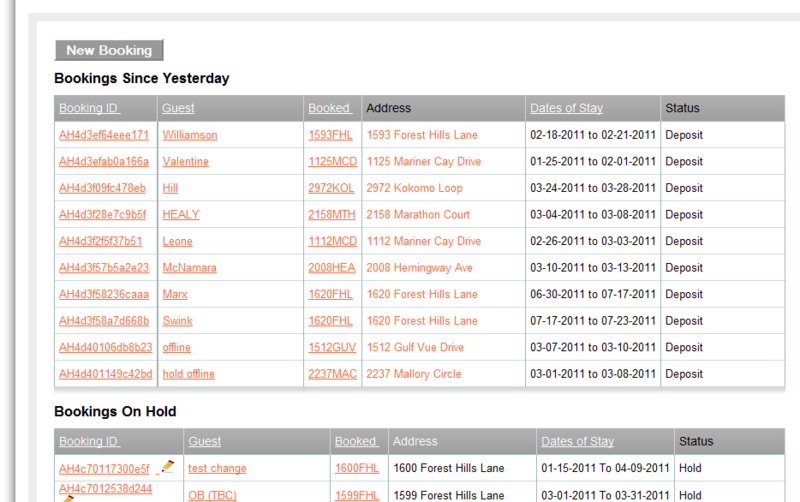 An overview feature has been added to allow you to see a particular property’s activity at a glance. 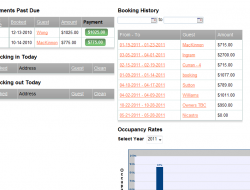 Payments past due on that specific property, those checking in and out, and a history of bookings is displayed along with an occupancy rate chart so that you can analyze a specific unit all on one page. 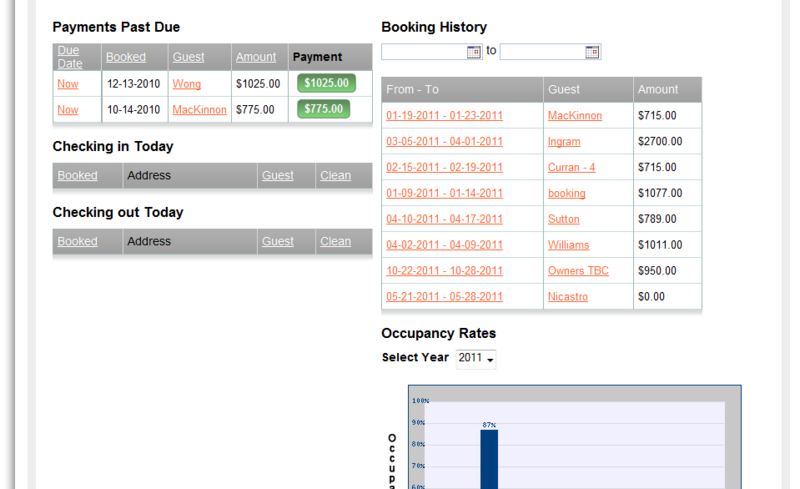 Users can easily manage properties, bookings, owners, managers, guests, and housekeeping services from a quick glance table. 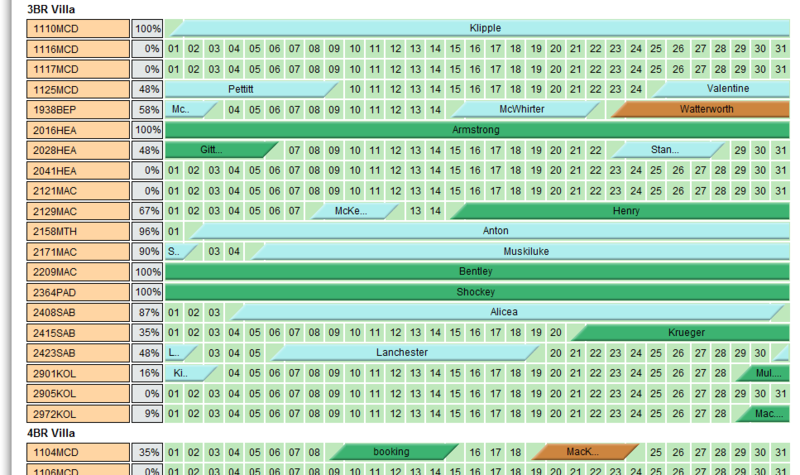 Each piece of data is organized with filters, keyword searches, and columns that sort according to the user’s liking.